Surgery is being commonly used to diagnose, treat and even help prevent cancer. In which the surgeon will cut into the body to remove the cancer along with some surrounding healthy tissue to ensure that all of the cancer is removed. However distinguishing cancer cells from healthy ones during surgery can prove difficult, if not impossible. Sometimes lesions are detected only postoperatively, leading to more surgery down the line. Currently, surgeons rely on vision and touch to detect tumors during surgery but in many cases there is still no good way to determine a tumor’s margins. In recent years, major progression has been made in imaging-guided surgery and doctors believe that use of fluorescent dye could boost survival rates by guiding them to tiny clusters of malignant cells. 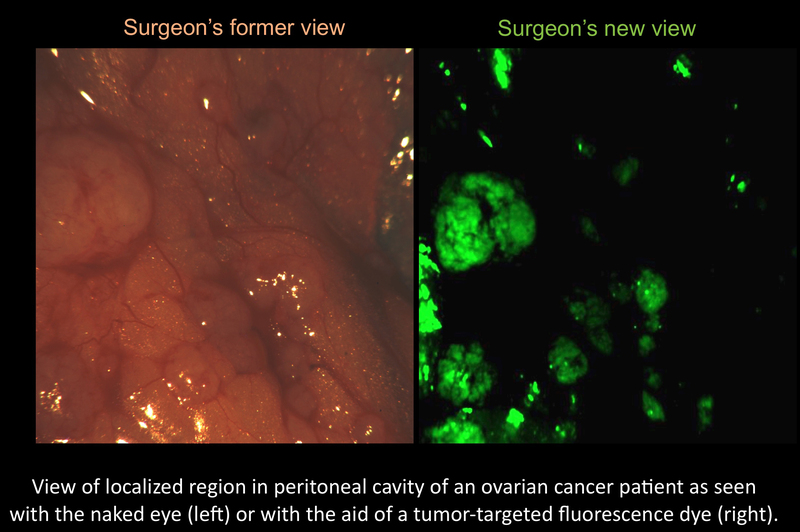 The first fluorescence-guided surgery in ovarian cancer patients have yielded great results and are summarized herein. ” Of all gynecologic malignancies, epithelial ovarian cancer (EOC) is the most frequent cause of death, both in the United States and in Europe. The relative absence of a clear, distinctive clinical presentation in early stages, combined with the lack of a screening tool, often results in the disease being diagnosed only at more advanced stages. The overall 5-year survival rate is 45%, and for stages III and IV it is only 20–25%.” Cytoreduction surgery followed by chemotherapy is considereed the most effective treatment. Radiologic approaches such as X-ray, CT, MRI and ultrasound have been considered for use in assisting surgical procedures, but these are not tumor specific and generally are not useful for intraoperative applications. Therefore, a better tumor-specific detection strategy may drastically improve the patient survival. The overexpression of folate receptor-α (FR-α) in 90–95% of epithelial ovarian cancers prompted the investigation of intraoperative tumor-specific fluorescence imaging in ovarian cancer surgery using an FR-α–targeted fluorescent agent. Moreover, the absence of FR-α on healthy cells leads to high tumor-to-normal ratios. As a ligand of FR-α, folate has already been conjugated to DTPA for SPECT/CT imaging and to several PET tracers. It has also been linked to fluorescein for use in imaging metastatic disease in murine tumor models, although this was never tested in humans. In this article, the authors have conjugated the folate to fluorescein isothiocyanate (FITC) for the use in surgery together with a real-time multispectral intraoperative fluorescence imaging system. Targeting of the FR-α in ovarian cancer in patients, the imaging agent was produced at clinical grade according to GMP conditions by Endocyte Inc. Folate hapten (vitamin B9) was conjugated with fluorescein isothiocyanate (FITC), yielding folate-FITC (See Fitgure). Folate-FITC has an excitation wavelength of 495 nm and emits light at 520 nm. The conjugate has a very high sensitivity and clusters of cancer cells as small as one-tenth of a millimeter can be detected, as opposed to the earlier average minimal cluster size of 3 millimeters in diameter based on current methods of visual and tactile detection. Folate-FITC was dissolved in 10 ml sterile normal saline and injected at a dose of 0.3 mg per kg body weight over a period of 10 min and was injected 2 hrs prior to the surgery. 10 patients with different stages of the over cancer were recruited, The mean age of all patients was 61.2 ± 11.4 (mean ± s.d.). Four patients were diagnosed with a malignant epithelial ovarian tumor (two serous carcinomas, one undifferentiated carcinoma and one mucinous carcinoma) and one patient with a serous borderline tumor. Five patients were diagnosed with a benign ovarian tumor, as confirmed by histopathology: two fibrothecomas, one cellular fibroma, one cystic teratoma and one benign multicystic ischemic ovary. The camera system (developed by the Technical University Munich/Helmholtz Center) consists of a charge-coupled digital (EM-CCD) camera (Andor Technology) for sensitive fluorescence detection and two separate cameras for detection of intrinsic fluorescence and color (PCO AG). The system is controlled by a synchronized multi-CPU computer system (Dell Computer) for simultaneous processing of raw data and image registration and rendering. The system allows color imaging and simultaneous sensitive fluorescence detection in the visible light spectrum, as appropriate for FITC imaging. Surgery and imaging procedure are described in detail in the article (1). Shortly, a live imaging during surgery enabled the surgeon to locate the tumor and remove it, biopsy was taken for further histopathology. n = 10 patients. ++, strong; +, moderate; 0, weak; −, absent; FIGO, International Federation of Gynecology and Obstetrics; IHC FR-α, immunohistochemistry folate-receptor alpha; FM FITC, fluorescence microscopy for folate-FITC; n.a., not applicable. Healthy tissue did not show any fluorescence signal either in vivo, ex vivo or on histopathological validation. In two separate still images of patients with ovarian cancer, the mean tumor-to-background ratio (as compared to healthy peritoneal surface) for ten demarcated fluorescent tumor deposits in each still image was 3.1 (± 0.8 s.d.). In the patient with a high-grade serous carcinoma and extensive peritoneal disseminated disease (stage III, FR-α positive), widespread tumor-specific fluorescence (white spots) was present throughout the abdominal cavity, as confirmed by ex vivo histopathology. Real-time image-guided excision of fluorescent tumor deposits of size <1 mm was feasible. Five surgeons independently identified tumor deposits on three separate color images (shown on a representative image in (Left) and on their corresponding fluorescence image of precisely the same area (Right). The number of tumor deposits detected by surgeons when guided by tumor-specific fluorescence (median 34, range 8–81) was significantly higher than with visual observation alone (median 7, range 4–22, P < 0.001). In this limited series, the authored showed that the use of intraoperative tumor-specific fluorescence imaging of the systemically administered FR-α–targeted agent folate-FITC offers specific and sensitive real-time identification of tumor tissue during surgery in patients with ovarian cancer and the presence of FR-α–positive tumors. Nevertheless, one patient presented with a malignant tumor that did not express FR-α, and consequently, no fluorescence was detected. A major advantage over current imaging modalities is that an intraoperative fluorescence imaging system offers a large field of view for inspection and staging. This, in turn, may permit future patient-tailored surgical interventions and may decrease the number of needless extensive surgical procedures and the associated morbidity. Improving the detection of cancer deposits to submillimeter size might ultimately improve survival rates, but whether this is the case needs to established by additional clinical studies. Overexpression of FR-α varies strongly between different solid tumors originating from different organs, a characteristic that reduces the general applicability of folate-FITC in cancer. Many organs have autofluorescence in the excitation and emission parameters of the FITC dye. Development of new fluorescent agents in the near-infrared spectrum will allow for identification of more deeply seated tumors, based on the stronger penetration properties of near-infrared dyes with an excitation wavelength >700 nm compared to FITC. This is the first in-human proof-of-principle and the potential benefit of intraoperative tumor-specific fluorescence imaging in staging and debulking surgery for ovarian cancer using the systemically administered targeted fluorescent agent folate-FITC. Larger international multicenter studies using standardized, uniformly calibrated multispectral fluorescence camera systems combined with folate-FITC are needed to confirm our data and further elucidate the diagnostic (accuracy, sensitivity and specificity) and therapeutic value of the reported approach in larger series of ovarian cancer patients. Note: Other similar approaches have been explored for brain tumors (3a, 3b) in human clinical trials using 5-aminolevulinic acid (5-ALA). We will not address this trial in this discussion. 3a. Stummer W, Pichlmeier U, Meinel T, Wiestler OD, Zanella F, Reulen HJ; ALA-Glioma Study group. Fluorescence-guided surgery with 5-aminolevulinic acid for resection of malignant glioma: a randomised controlled multicentre phase III trial. Lancet Oncol 2006 May;7(5):392-401. Tilda, a major issue during Ovarian Cancer surgery is the scan of the pelvic for “Fall-out” and migration of cancer cells from the Ovary to the pelvic. Furthermore, more than 50% of the cases are Figo 3 and more, which means that the tumor is not confined to the ovary any more. I could see a major advantage in using such intra-operative imaging device for general pelvic exploration as replacement to the current method of pelvic washing. Also, In this study, did the intervention started as laparoscopic (diagnostic) and evolved to open following indication of the FL. camera or was it open surgery from the start? I do really agree that most ovarian cancer are stage III.The spreading begins from the outer layer(superficial) of the ovary.Then the first site is the pelvic cavity.But in III-C the optimal debulking by the surgeons it’s crucial and directly related(the response to ct and prognosis) to minimal residual disease(better less than 1cm).So we have a new hope of improving the poor results of this malignancy!Congratulations Dr Tilda for the excellence of the post,this oncologist has apreciated very much this improvement,independently of the magnitud of the gain!Shalom! Dr. Barliya, this is great. It seems their selection of the folate receptor showed good specificity to stage III serous ovarian cancer and I am glad to hear that they will be making near infrared probes. I am surprised that there was no flourescent background given their use of FITC. Near infrared would resolve both this issue and the issue of detecting deep tissue malignantcy. Other people are using activatable probes against tumjor specific membrane enzymes like cathepsin D but this is great data. It is interesting that 5 independent surgical oncologist were able to verify results. The use of fiberoptics will make it much easier for the use of these probes to detect intraperitoneal malignancies. I wonder how big of a lesion they were able to detect? Dror, Thank you for your explanation regarding the “fall-out” aspect and the migration of ovarian cancer. This is a very important issue that the paper and myself haven’t addressed. “The surgery started as an opening the abdominal cavity through a midline incision, the surgeon localized the tumor and inspected and palpated the abdominal and pelvic regions according to FIGO guidelines. At this point, fluorescence video inspection at maximum FOV determined the presence of fluorescence activity, and multispectral images were captured. Next, the surgeon proceeded with the standard surgical procedure. All tissue suspicious for tumor involvement was imaged both in vivo, and ex vivo immediately after tissue excision, for the presence of fluorescence. Thereafter, the surgical field was inspected with the fluorescence system for remaining fluorescence, and additional multispectral images were captured. Biopsies were taken of residual fluorescent tissue as part of the standard operative procedure”. In the discussion the authors slightly address the aspect of laproscopic surgery: “In the laparoscopic staging setting, enhanced tumor detection with tumor-targeted fluorescence may lead to up-staging”. But further discussion showed be to follow. Williams, to your comment: Yes I totally agree with you, it was odd that the authors didn’t see any auto-fluorescence or no fluorescence background with the FITC probe which is known to have induce Organ -auto fluorescnce. As we know the research push more towards near-infra red light probes. Will try to be updated for any clinical trials using NIR dyes. Yeah, I;m familiar with the cathepsin D probe, there’re great work by Weissleder. To your question: , Real-time image-guided excision of fluorescent tumor deposits of size <1 mm was feasible and all fluorescent tissue was confirmed to be malignant by histopathology. Thank you Dr. Bretes for your comment on ovarian cancer and its spreading. I appreciate everybody’s input on the cancer staging. Ovarian cancer “a silent killer” is of major importance and we will try to add more posts on this topic. Glad, Dr. Awan’s post has inspired you to write about ovarian cancer. Thank you for presenting a cutting edge surgical procedure, first-in-man on ovarian cancer. The pros are very significant, selection of folate receptor as a site for a technology specific focus in diagnosis intraoperatively is a breakthrough vs convensional best practice, or application of dray, CT, MRI, ultrasound, prior to surgery in diagnostics. Please have another chapter in the Part of Medical Imaging, to be Florescencent Guided Spectrums, have Tilda’s Chapter there, Stummer’ on Glioma there, Dr. Williams, pl. Assign this task. Let’s have a Chapter on Ovarian Cancer to include Cilia, and Folate Receptore, let’s find in the literature one Paper on Mutation Analysis of Ovarian Cancer Tissue gene sequencing, have it’s review in this Chapter on Ovarian modalities of diagnoses. Dr. Scalia, pl. Take a lead on that and have the post in as your second post, following publishing your work-in-progress we discussed. Thank you, all, Dr. Tilda and all Commentators. Thank you for your comment. It is very welcome to create new context in a new article referring to this initial article, this methods make our Journal, one Scientific Journal and our EAWs, great ones.